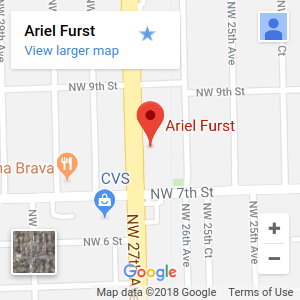 The Law Office of Ariel E. Furst focuses on the rights of personal injury victims. Personal Injury covers many areas of the law. There are various areas that our firm handles. These include medical malpractice, products liability, and other personal injury cases. See below for some of the types of personal injury claims our office handles. Our firm also represents individuals who have filed legitimate claims with an insurer, only to face delays or denial, or offers by the insurance company to pay less than the full amount of the claim. We handle claims under medical or health care policies, homeowner or automobile insurance, casualty, and theft policies. The use of experts is also utilized in these types of cases. Our firm also handles commercial litigation claims which include breach of contract matters. We have handled many business torts which arise from business disputes. We offer a free initial consultation to all clients. For an appointment, contact our office online or call 305-643-3100 Ext. 206. We handle all personal injury claims on a contingent fee basis. You pay no attorney fees unless we recover compensation for your losses. We will travel to meet with you, if necessary.